Who are the end-users? In the company, everyone is end-user since each one uses the IS, from the chairman to the operational agent : everyone uses the mail. Here, it is on the operational agent that we will concentrate our attention. It is him who, in practice, ensure the production, the contacts with the customers, the marketing etc. It is to allow him to receive the assistance of the automat that the firm makes most of the investment in the IS : the great software applications, which are the most technical part of IS, are conceived for him. The operational agent, it is the adviser of ANPE, the clerk in a banking branch, the operator in a call center, the human resource administrator, the accountant, the workman in general mechanics in front of his machine with numerical control etc. He is the one who must act, and for this reason must reflect and decide. It is advisable to distinguish among the operational agents those who work in the front office (relations with the customers, suppliers and partners in the call centers, the local branches, reception of the mail, the Web) and thus in contact with the external world, those who provide a logistic function of transmission (“middle office”) and those who handle the files (“back office”). One can also distinguish those for which IS is a permanent working tool from those who use it only a few hours per day. The diversity of the operational agents is matched by the diversity of the tools they need : the layout of IS, the animation of its good use must thus be based on an “internal marketing”, a segmentation of the population of the end-users in sub-assemblies, each with homogeneous need. The contemporary firm delegates more and more the responsibility for the operational decisions to the agents of ground themselves because that enables it to accelerate the cycle of production and to gain in competitiveness. This caused for these agents an increase, sometimes heavy, of responsibility. It is one of the reasons for which Taylorism is not in use any more : one cannot be satisfied any more to lead to content the division of the labor, then to specialize each agent in a narrow task, as in the industry of the Twenties. In order for his decision to be judicious, it is necessary for the operational agent to be able to anticipate their consequences. This implies that he knows the finality as well as the operation of the process in which he intervenes. The managers above these users must have indicators and alarms allowing to manage the production process, to locate and correct its failures, to debrief the incidents, to evaluate the charge of the resources and to reallocate them if need be. We will show that IS provides a language to the operational agent. In addition it is a tool for the action. These two layers of IS articulate themselves : the layer “what is”, contains the definitions and includes the semantics of the firm, the layer “how to” assists its know-how . The firm deposits in its IS the definition of the beings concerned by its action. They are represented there by files which data processing names “objects”. These beings are the customers, the suppliers, the partners ; products, intermediate consumptions ; techniques and methods of production ; the employees, the organization etc. 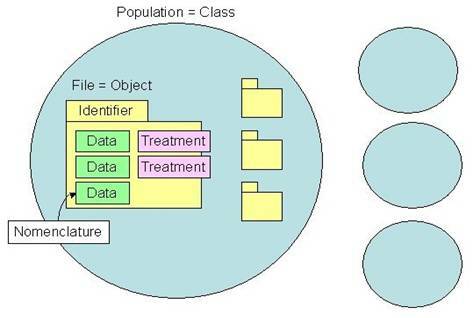 To each of these “populations” corresponds, in the language of data processing, a “class” or a “package” which defines the way in which each “individual” will be described. Each object, describing an individual, will initially be identified then characterized by a choice of variables which one will observe on him, the “data”. The definition of the populations, of the identifiers and the data, is the language of the firm. It will be, in practice, impossible to deviate from it once engraved in IS. If the file “customer”, for example, does not contain the indication of the date of birth, it will be impossible for the firm to segment its customers according to this criterion. For the firm, it will be as if the customers did not have an age. The language determines the categories according to which the firm describes and thinks the world and it thus delimits its capacity to act. The bill of material of the products, for example, will be used as guide for logistics and the inventory list as well as with the organization of the production ; the identifiers of the products will be used to name and classify them, in the oral language as in IS. It often happens that the IS is badly organized. The language of the firm is then degraded in local dialects. From one service to another, from one establishment to another, from one subsidiary to another, from one partner to another, the identifiers, nomenclatures of the products, classifications of the agents will change. Difficulties of communication will result from it : information will be able to cross the partitions of the language only by a transcribing which will always degrade the quality of the data. This situation, illogical as it is, is very frequent and one needs a huge effort to be freed from it. The French tax services used twelve different identifiers for the same taxpayer ; it was possible to put an end to this anomaly only at the time of the Copernic project. In such industrial firm, each factory uses a different catalog of products : it results from it great difficulties to formulate offers combining products from different factories. One of the very first stakes of IS is the consistency of the language of the firm, the suppression of the local dialects, so that the entities of the organization can communicate without loss of information. It is one of the tasks of the data administration. Once established coherence, it is necessary to maintain it : the synchronism of the amendment of the tables of coding, the fight against the degradation of the language are permanent and delicate tasks. This formal quality, coherence, is however secondary compared to a practical requirement, the relevance. The definition of the objects, the data, results from a choice because one could a priori observe on a customer, on a product, an infinity of various data. It is necessary that the language of the firm be adequate with its action : it must observe and preserve the data necessary for it to act, and these only. It is not really necessary to stress that if the requirement for relevance is expressed in few words, to satisfy it supposes a very fine understanding. And when the action is mentioned, it is towards the production process that the attention moves: this naturally leads us to the second aspect of the legibility of IS. Any operational agent is implied in various production processes. In each process, he receives a task to be done, carries it out, then transmits the result of his work to one or several other agent(s). Today, it is the IS which ensures the logistics of the files from one agent to the other (table of addressing, checking of pre and post-conditions, control of the deadlines) or which marks out the logistics of the raw materials and semi-finished product. 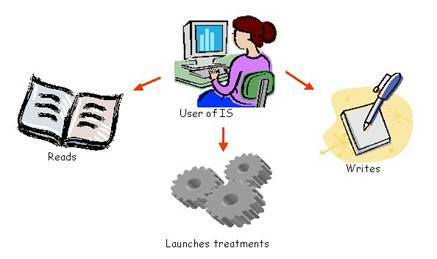 The work which an agent in IS does is summarized with three actions: to read, write, launch treatments. One could certainly remain with this poor definition, and organize about IS a kind of Taylorism of information : each one would only have to perform, in a repetitive way, a very limited task. There lies a temptation, because this Taylorism would be against the decentralization of the responsibilities and decisions which we mentioned above, and which became the rule in the contemporary firm. - What is the nature of the customer ? 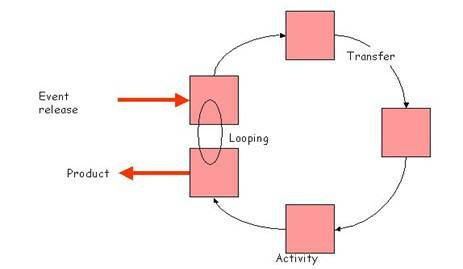 - What is the product to which the process must lead ? - If this product is an intermediary deliverable, what is the end product to which it contributes? - What is my specific task within this process ? - What can be the consequences of my decisions ? - How does my specific task articulate with that of the other agents intervening in the process ? - What are the requirements for quality to which the process must obey (time, satisfaction of the customer, performance etc) ? - What are the indicators at our disposal to check the respect of these requirements ? - What is my personal contribution to quality ? The quality of the process will be supervised by an administrator who must also check the consumption of the resources (in particular the workload of the operational agents), to locate the incidents, to animate their debriefing, to propose or carry out amendments in the organization of the process. Daily statistics, alarms, will be provided in addition to the operational manager who ensures the immediate managing of the agents. When one thus organizes IS around the process, one breaks with the former organization in “software applications” so that the interface provides to the user, at any moment, exactly the view which he needs on IS : that implies that one relieves him of the navigation from one software application to another, of the repeated identifications and authentications, and that one abolishes the double inputs which are the corollary. Let us observe that the right of the agent to read, write and launch treatments is limited by his access right : the legibility of the process, its “transparency”, do not separate from the correlative management of the confidentiality. To provide the user, at every moment, with precisely the windows of consultation and input and the tools for treatment needed, to make so that the interface evolves and adapts at the various stages of its activity, is to provide him with the simplest and most convenient tool. For the information system and the data-processing platform which supports it, it is a very high ambition and it is, in practice, difficult to entirely reach it. IS which carries it out, and which thus arrived at the top of the state of the art, will appear however to the user very simple and, basically, very natural… The user, naturally ungrateful, will not perceive the difficulties that data processing had to surmount to offer this “simple” tool, to ensure its performance and operation without breakdown. Management of synchronism and competition, physics of the data bases and the transactional motor, dimensioning of the processors, memories and networks, protection of the safety, relaunching in the event of incidents : these questions, which are pertaining to data-processing technique, are for the user like the adjustments of the engine of his car. He expects it to be well done, will protest in the event of incident, but does not see how it is done because that does not relate to nor delimit his action, whereas this action is directly related to the language of the firm and the organization of the process. It results from it that legibility of IS for the user is not the same as legibility for the Project Development and the Analysis. The project development must, of course, have a clear visibility on the solutions adopted for the platform ; and the project development must (1) express to the analysis its requirements concerning the performances of the platform ; (2) obtain from the analysis the credible guarantee that these performances will be carried out, which supposes on behalf of the project development a sufficient comprehension of the technique. The customers, suppliers and partners are also end-users of IS. The customers feed it (for example while filling forms on the Web, or by using the electronic payment) and they come into contact with the firm via various channels (telephone, mail, Internet, meetings). The firm must thus conceive a multi-media IS which will ensure the uniqueness of the relation with the customer, whatever the channel of communication that this one follows. The customer indeed expects, when contacting the firm via the Web, by telephone, visit or mail, that the indications which he provided at the time of his former contacts are known of his interlocutor. To the suppliers, partners and regular important customers the firm must provide on its IS a narrow, because delimited by strict access rights, but very clear window. This requirement will be expressed in terms of interworking. That supposes that IS are on both sides of good quality, that they ensured the coherence of the language and the transparency of the process at least for the shared tasks. When the language is coherent and its relevance was assured, when the processes were organized and are familiar to the operational agents, the firm itself is legible through its IS: it is elucidated and radiates its own light. It results from it, for the agents, clearness and simplicity. In the elucidated firm, equipped with a legible IS, one hears sentences like those: “we know what we have to do”, “we are well managed”, “the job is simple”, “work is interesting, we know our usefulness” etc. The firm, the general management, are directed towards the production, the effectiveness, the satisfaction of the customers ; the strategy was clarified at the time of the definition of the language and the processes ; the practical problems of the trade, and not the conflicts between managers, are now feeding the conversations at the canteen. Consequently the operational agent knows the extent of the decisions he can take and can anticipate their consequences. He knows the responsibilities which he can assume and which do not crush him. He knows the indicators of quality which relate to the process : they are forwarded to him as an obvious drawing, which encourages him to maintain them at a good level. The process is not for him a machine defined a long time before, whose finality was forgotten, and that the firm uses as a habit : it represents a collective step, with practical purpose, directed towards the production and the satisfaction of the customer. When it is necessary for him to adapt to a new situation – new product, news production techniques, new form of marketing, new market – he will know that the process should be amended, since its finality changed. Then the firm does not meet any more these obstacles to change which result from the conflicts between baronies and between corporate bodies, or from a rigid following of practices of work whose finality was forgotten. It has become evolutionary. Initially by urbanizing the firm, by modeling the processes, by founding a data administration, by installing the indicators, by appointing administrators of process. These steps provide the raw material for legibility, which consists quite simply of a well conceived IS : and each one knows that it is not simple. But it is not enough to have a well conceived IS : it is also necessary that its presentation is published in a suitable and legible form. Obviously, the publication of UML diagrams does not answer to this requirement. Certain firms use tools which enable them to produce, over the top of the urbanization and the process models, the editorial layer which will confer the visibility on IS. 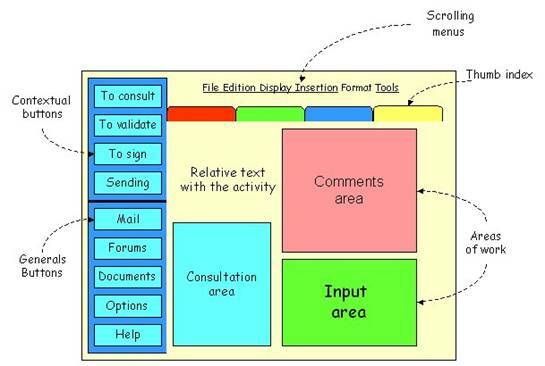 These tools show the processes as cartoons : the agents are represented there by small characters, located in buildings and in front of materials similar to those of the firm, who produce documents and swap messages. Graphic simulation is accompanied by textual explanations which open on demand, as well as a tool for formation giving to each one the possibility to control his level of knowledge. The training thus given must be renewed in the duration : it accompanies the activity of the agents. Let us observe that if each segment among the end-users has a specific “view” on IS, the tool which provides them legibility must be declined according to each one of these views, coherence between them resulting of the fact that they give to see the same and only IS. In the duration, these views will have to be updated to follow its development. It matters that their updates be sufficiently synchronous so that there is no risk of inconsistency. One can finally evaluate legibility, such as it is perceived by the users, by introducing this question into the surveys of satisfaction relative to IS. Legibility is possible, it is convenient, it brings to the firm effectiveness and evolutionarity. The need thus seems obvious. However, we know it, most of IS are not legible. Why ? On the one hand, it would be impossible to make legible a badly built IS, the IS of a firm whose language bursts in various dialects and who did not organize his processes. But even in a firm which has a suitable IS, one will not always think of making it legible. - It is often believed that the IS is a technical business and one neglects the semantic dimension of the firm, the stake of the quality of the language. - In addition in certain firms it is still believed that the organization must follow Taylor’s principles to be effective while at the same time one asks the agents initiative, decision and use of responsibility. - It also happens that the solidarity which is created between the firm, its products, its customers, its operational agents opposes the baronies which militate, on the contrary, for the partitioning of the firm and the bursting of its language and prefer to avoid letting appear their performance in the indicators. - The approach of IS by the processes, finally, runs up against the inheritance of a data processing which, for perfectly sound historical reasons, was organized initially around the algorithms, then around the data, whereas the organization around the process supposes that one concentrates on the construction and the cycle of life of the objects. None of these obstacles seems insurmountable. The stakes of legibility are expressed in term of effectiveness, quality, accuracy of the operational decisions, evolutionarity of the firm. Many firms have understood their importance. It results from it, a change in their attitude towards IS. Whereas this one seemed formerly technical, abstract, far from the practice and not easily visible, it became the close relation and faithful companion of the professional practice. The discussions relating to its definition and its development were transformed by it. The expression of the requirements became more reasonable, selective and stable. The necessary compromises are reached more easily, which supported the evolutionarity and the flexibility of the firm still more. The critic of Taylorism is so old that it became banal, but the worship of the division of the labor of which it is the expression is still long-lived in the firms while at the same time the contemporary forms of organization should impose it severe limiting. Gerald Abelson and Jay Sussman, Structure and Interpretation of Computer Programs, MIT Press 1996, p. 22. It is normal that a trade of the firm uses, on the objects concerned with its specialty, detailed nomenclatures. But it matters that the coherence of the language is ensured for the data communicated from one trade to the other.